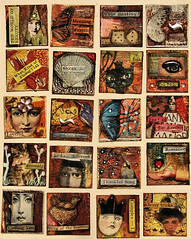 For those of you who hadn’t seen, or read about this project yet… check out my prior posts on it first..
Part 2 : 100 1″ Collage Squares w/ Tutorial! Man, am I ever behind! My health has really gotten the best of me recently, both mentally & physically. Turns out to fix the complication, I need another surgery… I’ll talk about it more later this week, after I catch y’all up on the huge stack of art I have waiting to show! Despite my online absence, I have been busy creating, and experimenting as time, and my health allows. Besides, isn’t reveling in art .. far more fun? It was terribly difficult trying to get good photos of these, so please bear with me .. the colors aren’t nearly as rich, the textures don’t show well.. and the tones are off…ugh! 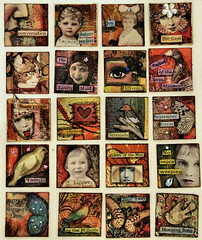 This swap has been completed, and I received 100, absolutely gorgeous squares back the other day .. (Julie really is one of the best hosts around) .. and I have to say, this is among the handful of swaps, that I am most pleased with.. I wasn’t disappointed at all! It’s a stunning array of talent, and art.. and I can’t wait to create something with it, and show you all. 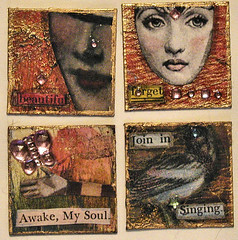 Those 4 were created for a private swap with the ever talented Zorana! If you’re interested in swapping some with me, drop me a comment .. and please know it may take me up to a month to be able to complete them, and ship them out! Let me know what ya think of the new ones! I do still plan on hosting a swap for these, but not until after the holidays — this is such a hectic time of year for everyone as is! Still itching to see more? Check out these lovelies by other artists! Julie’s squares are stunning as well! Interested in a swap? Rella has a neat idea! Zorana has an ongoing swap! Lara plans on doing one a day, for 100 days! Heather made some Fab squares! Anne has integrated these into an online class! Kim, created some STUNNING monochromatic pieces.. my fav..white! Stacie also joined in on the fun! Check out these backgrounds Trish created for the 1″ squares! Have a fabulous, artful day! Let me know what ya think of the new ones! Awesome! I’m so glad you are back to arting!!! That was quite an undertaking to get 100 done! Yo ugo girl! Oh it is SO nice to “hear” from you on your blog. I’m SO glad you have still had time to create and that you are moving along as usual there! you are such an inspiration to me! I love your squares. I’ve been thinkin’ of doing some and now that you posted a “tutorial” I may try to attack those little buggers. one day I cut a 1 inch square out but still didn’t think I could do it! lol! so tiny, but everyone loves them it seems. Ok, well before I make this a book, I’m sending you my best for your surgery situation and again it’s so nice to see your work and “hear” from you through your blog! Oh! Sad to hear you have MORE surgery to fix all the issues! Some times it seems it gets worse before it gets better…this time next year you are going to be in fantastic shape and forget all the pain and set backs! I love your art! The 100 1″ squares … Inspiring! I have a hard time with that small area…you are brilliant with them! AND I am so lucky to have in my collection some Zorana art myself! I bought one of her beautiful journals and some of her transparency tags! YUM ~ I love her style! Lucky you for trading with her! Working so tiny is NOT easy. 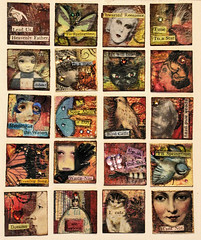 I took the chicken way out and am hosting a swap for 1 1/2″ x 1 1/2″ squares currently on my yahoo group, Altered Michigan. Kudos to you for making the commitment to 100 inchies. I think now that I have tried the larger ones, I will make a greater effort to do the true “inchies”. Thanks for your inspiration!